It’s a beautiful day in early spring. You are standing beside a beautiful river flowing through the mountains of Colorado. In your hands you hold your gear. You are brimming with excitement as you imagine what you will catch today. You are getting ready to fly fish and you can’t wait to get started! People have been fly fishing for years. In its beginnings, people would use flies to fish with for food, but then it turned into a sport and now anglers fly fish for both food and sport. Fly fishing is a traditional angling method that uses artificial flies for lures that are made of materials like fur and feathers. The flies are fastened onto a hook and are meant to imitate a fish’s natural food source. The rods are light, but the lines are heavy providing the weight and momentum for casting. Fly fishermen use a series of casting moves meant to imitate the bug on water. The techniques are wide and varied. When casting much of the rod’s movement comes from the angler’s wrist. Fly fishing as a sport is something many people find amazingly enjoyable. Most fly fishing is done in certain places like Colorado, Montana, and Wisconsin. The fish most often caught are trout and salmon, although anglers can catch a variety of fish with their flies. In this book, we’ll explore a variety of topics with regards to fly fishing. Some of the information will be geared towards beginning fishermen, but experienced fly fishers can benefit from this information as well. A refresher course is always good in any sport! We’ll look at the gear you’ll need, ways to tie flies, and the best places to find an excellent fishing spot. You’ll learn about places to buy your gear from and what to look for when you are buying that gear. This author is an equal opportunity person and no disrespect is meant to women who like to fly fish when I use the term fisherman. Because most of the time we say the word “fisherman”, don’t fret gals, I’m talking about you too! 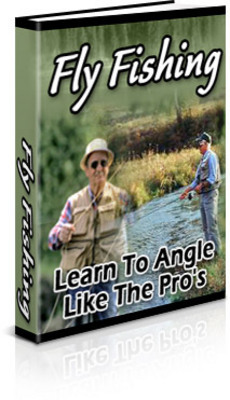 FLY FISHING LEARN TO ANGLE LIKE THE PROS PLR fishing;learn 146676298 4.99 videokurdu Fresh Download Available!